Home / Blog / Experience Huong Hai Sealife cruise! Relaxing in the room on Huong Hai Sealife cruise, tourists can enjoy panoramic views of Halong Bay at private balcony or through large windows. The yacht rooms are decorated with a large picture of the vast ocean, or record the daily life of coastal people. Each picture tells a different story so that visitors feel the spirit and taste of the sea. This is also the way Huong Hai Halong shows the meaning of the name “Sealife” of the yacht, which impresses visitors. 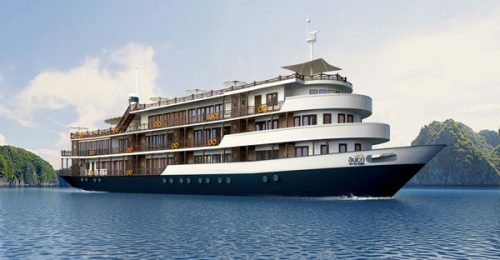 Rooms on Huong Hai Sealife consist of 2 types: Suite (22 rooms) and Executive Suite (4 rooms). Suite room is 22m2, equipped with furniture for tourists to enjoy the best quality of service. In particular, the furnishings in the room are handmade pottery products from the famous Bat Trang Pottery Village. The sunbathing area on the top floor of Huong Hai Sealife cruise are favorite space for a lot of tourists, especially foreign tourists. 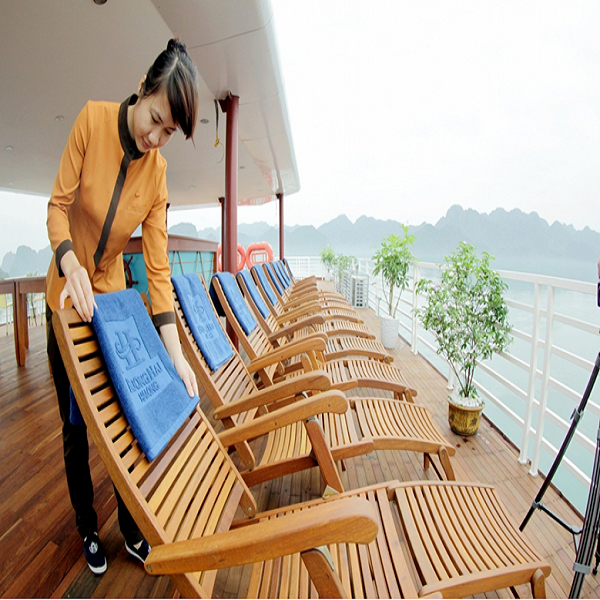 Here, visitors can lie on the sundeck, to both enjoy the fresh air, cool and just watch the beautiful scenery of the tranquil Halong Bay in the afternoon or sunset. After participating in fun activities, visitors will come to Sea Flora restaurant, which is located on the yacht to enjoy the specialties made of fresh local ingredients. In the spacious, cozy atmosphere of the restaurant, tourists can enjoy a cocktail or a favorite drink in a small bar of the restaurant, while admiring the beauty of nature outside. To appreciate tourists’ trust and support during this time, this summer, Huong Hai Company is developing many attractive promotions. From 2016 until now, Huong Hai launches the “Super Summer promotion” programs, with extremely attractive prices for visitors using Huong Hai Sealife cruise service. 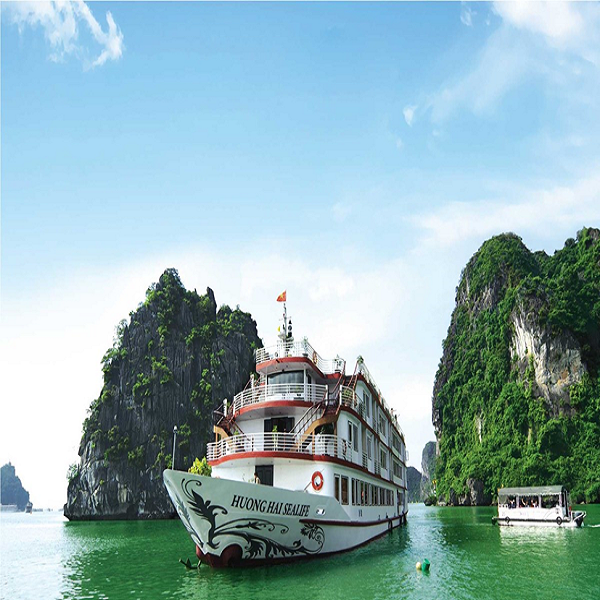 Joining the Halong tour with Huong Hai Sealife cruise this summer will certainly bring visitors unforgettable memories. If you want a quiet space, tourists can come to the tea room area. Your excursion will become more poetic when you spend your time sitting here, sipping a hot glass of tea and reading a good book, or chatting with your loved ones. On the journey to explore the beauty of Halong Bay, visitors will be engaged in exciting activities such as visiting spectacular caves, kayaking or relaxing on the deck. Especially, at night, visitors can experience to be fishermen with squid fishing which is extremely attractive activity. After hours of fun play, visitors will enjoy seafood, and traditional Vietnamese dishes at the on-board restaurant. 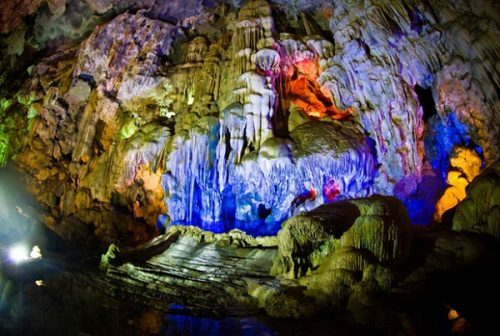 In particular, Huong Hai Halong can help you organize a party or event in a cave or on a beach. Admiring the stunning view of Halong Bay from spacious sundeck, and enjoying the delicious cuisines are all the unforgettable experiences. Let’s get to Huong Hai Sealife cruise to have truly trip to admire the beauty of Halong Bay with luxurious stay services!